Quicklets & Greenpak Keep It Clean! Quicklets teams up with GreenPak: contributing to recycling services. 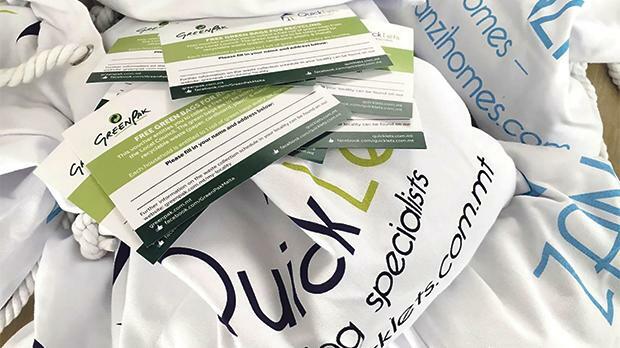 Since April, Quicklets – the prop-tech company focusing on letting - has embarked on a new campaign, that sees their foreign clients receive Welcome Packs with each property they rent out. Steve Mercieca, CEO and Co-Founder, explains more about the initiative: “We constantly aim to give a different service than other property agencies. This simple Welcome Pack has nothing extraordinary, but it differentiates our product from others’ as we welcome our customers in their new home with a token of our appreciation. It’s also about giving foreigners a taste of Malta, with some iconic local items, and preserving the environment”. The packs contain local beverages and food items, as well as toiletries. In line with their environmental campaign, the packs also contain contribute water (in collaboration Farsons and Contribute ltd., who finance charity projects) and recycling bags, in partnership with GreenPak ltd.
A pioneer of post-consumer waste recovery in Malta, GreenPak provides waste collection services. It also works with local councils, offering superior services to their residents and business communities to separate waste. Currently, 42 local councils are collaborating with GreenPak, covering 74% of the country’s population. GreenPak has strongly proved itself, firstly, by experiencing an impressive average increase of 20% in the total recyclable waste material collected in recent years. Secondly, it has been presented with a Special Award by Koperattivi Malta, for bringing together a large number of companies to finance vital waste recycling services to the community. Other criteria included merits of educational campaigns, such as ‘Nirrickla ghall-Istrina’ and ‘Irrickla u Irbah’. GreenPak has yearly promoted schools and businesses to collect plastic caps. Millions of caps are collected and the proceedings go toward ‘l-Istrina’. The altruistic links between recycling and helping others is a strong feature in this campaign. The ‘Irrickla u Irbah’ campaign, now in its 7th year, promotes recycling by randomly selecting members of the public with token gifts. As of now, Quicklets has formerly entered into partnership with GreenPak and local councils around Malta and is giving out flyers to customers who can then exchange them at the council for recycling bags. Quicklets’ company values are clearly in line with those of GreenPak, as Quicklets COO Fabio Zuccaro puts it, “Our brand is growing, and so are our projects on sustainability. Steve has built a brand that centres upon the value of giving back to society, and our end-goal is not just to rent property. Together with our sister brand, Zanzi Homes, we have embarked on our Treedom campaign, planting a tree for each home we sell, and executed several clean-ups on the island. Now, we want our Welcome Packs to reflect our values and help foreigners get accustomed to the waste separation service, as they settle in Malta.